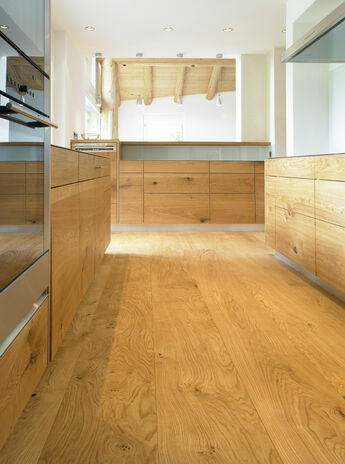 Almost all mafi natural wood floors are suitable for underfloor heating. mafi floors are even pre-destined for underfloor heating, thanks to the symmetrical three layer construction of the planks. The intense temperatures acting on the floor are the general problem with underfloor heating. It should be noted that wood is a natural material, which is influenced by the prevailing temperature and humidity. 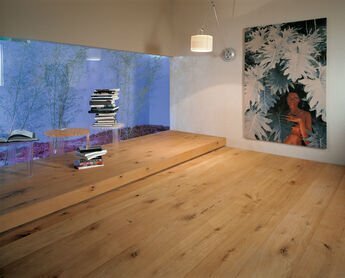 At high ambient humidity, any wooden floor absorbs moisture and increases its volume. 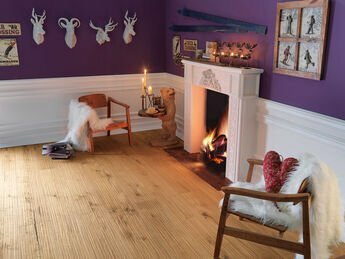 At low ambient humidity, as is the case in the heating season during the winter months, the wood releases moisture and reduces its volume - gaps are formed. mafi’s symmetrical plank construction already noticeably reduces this effect. Both the top and also the back layers are made with the same wood and same treatment. This results in a counter move which greatly restricts the warping of the plank. However, it is possible for gaps to form if the humidity drops too far in rooms equipped with wooden floors. Don’t see this as negative, but as evidence of the naturalness of your wood floor. A healthy indoor climate is also necessary for the well-being of people. During the non-heating period, gaps close up again. We recommend a full surface bonding on the underfloor during installation. In this variant, permanently elastic glue is to be used to give the floor the required flexibility. In addition, a complete underfloor heating protocol must be available. The surface temperature of the floor should not exceed 29° at any point at a room temperature of 21°.